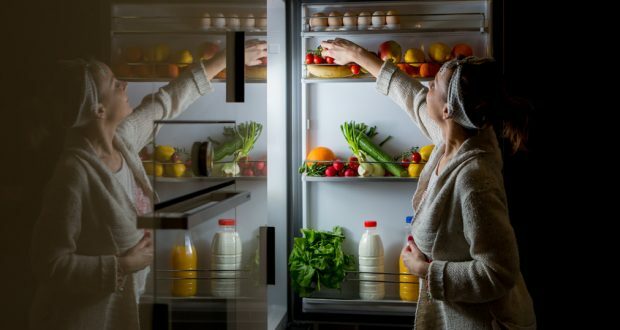 New research by the John Hopkins School of Medicine found that people are more likely to overeat in the evening hours than at any other time of the day – especially when we’re feeling stressed. The study focused on two hormones. The first being a hunger hormone called ghrelin, and the second being peptide YY, a hormone tied to a feeling of fullness. The participants fasted for eight hours, then got a liquid meal at either at nine o’clock in the morning or at four o’clock in the afternoon. Two hours later, “stress” was induced in the participants by placing a hand in a bucket of cold water for two minutes. Half an hour later, participants were presented with a buffet full of pizza, chips, cookies and candy to see if they would indulge. Researchers tracked levels of both the hunger hormone and the fullness hormone throughout the experiment using blood tests. The results showed that the participants’ hunger hormone levels were higher in the evening than in the morning. The fullness hormone levels were lower in the evening than they were in the morning. The “stress” action shot hunger hormone levels even higher, but not in the morning. Only in the evening did the stress induction seem to be connected with increased hunger. Basically, if you are stressed out and/or already prone to bingeing, you are far more likely to overeat in the evenings – science has proved it! However, eating because of emotion is a dangerously unhealthy coping mechanism. Those emotions, thoughts and behaviors can continue to spiral, having a potentially catastrophic effect on your health. So, when those stress-cravings come calling, what can we do to combat them? Don’t tell yourself you must make healthy choices only from this point on. Saying you will never eat a certain food for the rest of your life is unrealistic. Portion and moderation are key. A food journal is a great way to hold yourself accountable for your food (and portion) intake. For diabetics, journaling can be especially helpful. Tracking your blood sugar alongside your food and beverage choices can provide some seriously revealing insight. For example, if you notice that your blood sugar spikes after eating a tangerine for your morning snack, and does not spike if you enjoy an apple instead – there’s one easy blood sugar fix! Also, try to focus on how you felt before, during, and after your meal. Emotions and food are closely tied, yet we rarely connect how we feel with what/when we eat. Certain foods literally make your brain and body happy! In the same turn, stressful situations can trigger the desire to eat. “Closing the kitchen” after dinner can be another helpful strategy. Tell yourself that once you’ve finished your evening meal and the dishes are washed, you are finished eating for the night. Not only will this help to prevent night-time snacking, it can also help ward off higher blood sugar the next morning. Previous: Net Carbs – How Are They Affecting Your Blood Sugar?